In this tutorial, create a business hierarchy of propositions. A proposition can be anything that you can offer to your customer, for example, goods, advertisements, services, and so on. In Pega Platform™, propositions are organized into a hierarchy that consists of the business issue, group, and proposition levels. The combination of these levels provides a unique identifier for each proposition. Business hierarchy is customizable, which means that you can adjust it to your existing product offering. As a decisioning architect, create a business hierarchy of propositions that reflect the current business offer of your company. As an example, create a group of propositions for phone devices. Create a business hierarchy that contains products that your company offers. First, add a group to an existing business issue. Within the group that you created, define propositions that represent the products that your company wants to offer to your customers. Define a business issue that is the purpose of a proposition, for example, sales, retention, service, and so on. In the Customer Decision Hub portal, select Configuration > Decision Management > Proposition Management. In the Business issues and groups section, click Add > New business issue. In the Create new business issue box, specify the name of the business issue and define the application context. Confirm your settings by clicking Create. Create a group for propositions that belong to a specific category, for example, bundles, credit cards, mortgages, loans, and so on. In the Business issues and groups section, click Add > New group. In the Create new group dialog window, enter the name of the group. 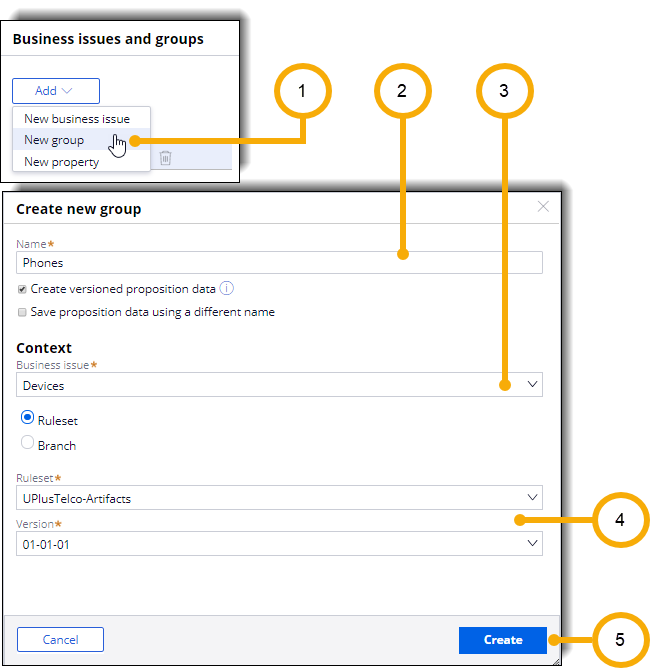 In the Context section, select the parent business issue for the group. Specify the application context of the group by selecting a ruleset version. Add propositions that represent actual offers that you want to make to your customers. In Customer Decision Hub, you can create versioned propositions only. For more information, see Versioned propositions. In the Decision data records for versioned propositions section, click the name of the group. In the Decision Data rule, in the Data tab, click New. Specify the proposition name and description. Select Always to offer the proposition to customers without an expiration date. Select Never to prevent the proposition from being offered to customers. Select Within a defined time period to offer the proposition to customers only within a specified period, as defined by the Start Date and End Date parameters. Optional: Configure any additional parameters that the system architect defined for the proposition, for example, the phone price. Confirm your settings by clicking Create and saving the rule. For more information on propositions, see Proposition Management landing page. Defining business issues that describe the purpose of each proposition and creating groups that logically classify propositions into categories, allows you to build a business hierarchy of products. Define actual propositions that reflect the products and services that your company offers to customers. Expand your knowledge of propositions. For more information, see Proposition Management landing page. For more hands-on experience, complete the Importance of propositions module of the Pega Decisioning Consultant course. Build a decisioning strategy to determine the customers who are eligible to receive the new propositions. For more information, see About Strategy rules. To practice creating strategies, complete the Decision strategy canvas module of the Pega Decisioning Consultant course. Build an application overlay to allow business users to create or amend rules in your application. For more information, see Revision Management landing page. For a tutorial on how to manage propositions, see Updating propositions through revision management.